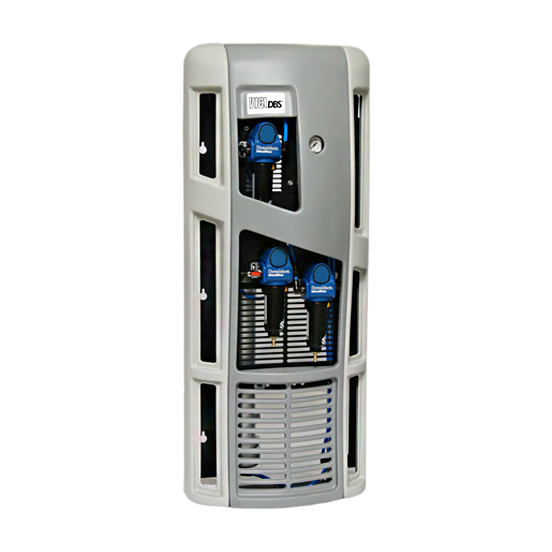 The Whisper nitrogen generator is used in Liquid Chromatography/Mass Spectrometry (LCMS) applications. It can also be used for the evaporation of solvents in samples being analyzed. The simple, highly efficient membrane technology separates nitrogen from the other components of a compressed air supply. The low pressure drop (1 bar) means that the Whisper can share a dry, oil-free compressed air source already in the lab. The consistent purity of the nitrogen in the Whisper improves system stability and ensures reproducible results. The large nitrogen volumes used in analytical labs for LCMS techniques mean the gas bottles used in a lot of other labs are insufficient when it comes to ensuring good lab productivity. Nitrogen produced at low pressure and room pressure eliminates the risks associated with high pressure gas bottles and the handling of liquid nitrogen.